Full cast, sound, and scored audio drama with four original songs about two tigers and how they must cope with the arrival of Man into their jungle domain. 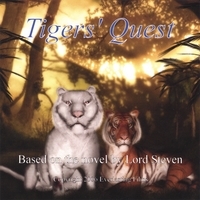 Don't forget to order The Music of Tigers' Quest! Incredibly, Everlasting Films (aka Superiority Complex Audio Dramas,, $egal/CHORD productions, Infinite Imagination) is not a trade name, registered DBA name or corporate entity. None of the required docs have been filed with the Fresno Co., CA county recorder as required by law. The author uses a pseudonym. Bottom line, there is no copyright associated with this material because none of the referenced entities exist. It's open season on this one. Use/resell to your hearts content! Ditto the Dr Who Audio Dramas. NONE of those entities are registered or recorded DBA names. Duh, David, Tom and Shelley. If you break every law in the book you can't just slap "copyright" on it and think you have any legal rights. Research it yourself. This one has been left WIIIIDE open!